Paul Leinster, Chief Executive of the Environment Agency, talks about their experience of moving to GOV.UK a year on. Life continues to change at the Environment Agency since we moved to GOV.UK in April 2014. We have moved from 3 tiers to a national/local organisation as a result of major organisational change. We have a wide range of customers with diverse needs. These range from anglers who buy licences to those who operate nuclear power stations. We provide a flood warning information service to the public which helps keep people safe. We want to make it easier for all our customers to do the right thing whether this is buying a rod licence or registering as a waste carrier. By reducing unnecessary complexity and improving our services, we are helping business to operate responsibly. 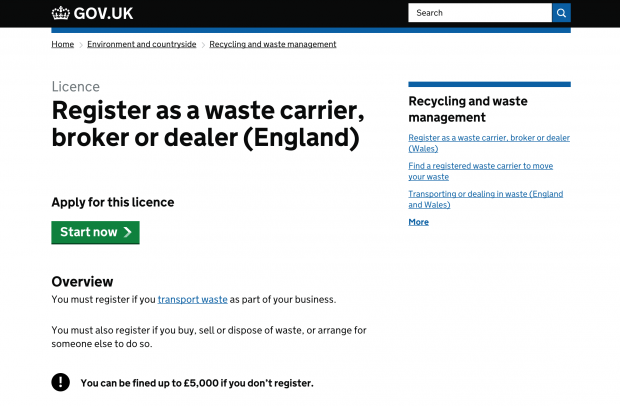 Our online waste carrier service is one of GDS’s exemplar services. It quickly registers customers online. This helps us target our efforts on those that do not operate within the law and it reduces the administrative burden on industry. There have been over 37,000 registrations, a 95% digital uptake and a customer satisfaction rating of over 90%. Reducing complexity and meeting our customers' needs was a fundamental part of our move to GOV.UK. Our digital journey was not always easy. Ours was one of the largest and most complex transitions across government. To simplify the content for users, we moved, reviewed, republished and archived a total of 25,000 html pages and over 10,000 documents. But we completed the move on time and I am proud of the team who guided this through - they have recently been highly commended for a project excellence award because of the standard of project management they adopted. While there have been some pointed comments made about the loss of some of our web based content, the number of complaints about the website has reduced since joining GOV.UK. We have learnt a lot from moving our content to GOV.UK and we are still learning. As part of Defra’s Smarter Environmental Regulation Review we have been reforming our guidance to reduce duplication and make sure it meets user needs. So far we have almost halved our external guidance. We used to write what we thought customers needed to know. Now we write concise information based on user needs, so that people can understand quickly what they need to do and spend less time reading complex guidance from a number of different sources. As GDS says, GOV.UK is not finished. We know that some of our customers mourn the loss of access to some technical information which they found helpful. We are exploring how we bridge this gap by, for example, publishing best practice guidance on partner websites. We are continuing to use feedback from customers and analysis of web traffic to make improvements to the way our content is organised. By working closely with GDS, we will improve our customers’ experiences and support business and growth by making it even easier to understand and comply with the law and as a consequence keep on creating a better place for people and wildlife. The Environment Agency home page on GOV.UK is at www.gov.uk/environment-agency, where you’ll find links to our guidance, research, news and contact details.